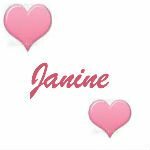 My girls are definitely girly girl princesses as most who follow my blog already know this. They love hair accessories (ponytail holders, clips, headbands), nail polish, pocket books and just about anything fancy to add onto their outfits and/or bodies. 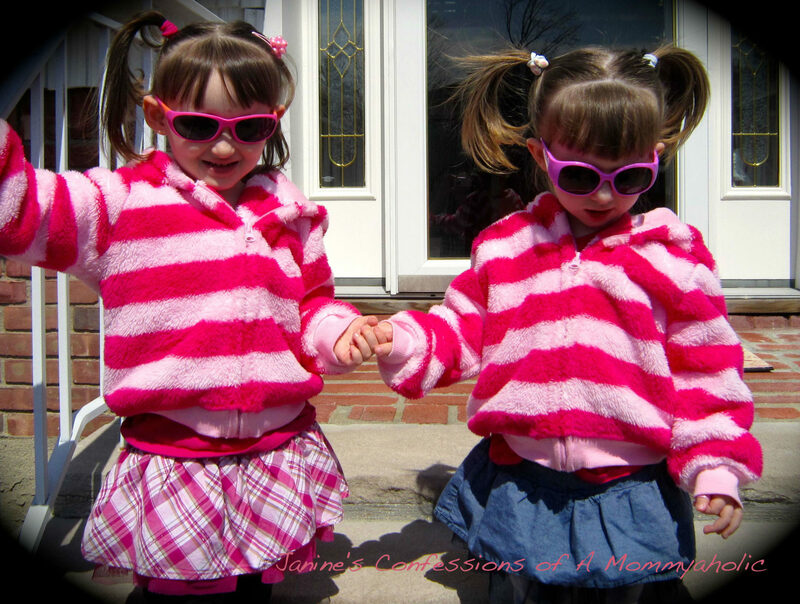 About a week ago, I was contacted by Real Kids Shades (RKS) to review the children’s sunglasses. I immediately thought my girls would love to get their own pair of cool shades. As luck would have it, we were offered a pair for each. Thank god no fighting or having to share. The best part was that both pairs were to be pink, the little princesses favorite colors!! Awesome Box of Real Shades Sunglasses!! Just in that order by the way!! Once Lily caught on, she too was ecstatic and very willing to sample a pair each. We received one pair of the 3-7 Flex Pink and also a pair of the 3-7 Flex Duo Pink Orange. The both wore them from home to the drive to pre-school happily. Each of these pairs of sunglasses were worn and were just perfect for both my girls. It is ironic, because I have been worrying a bit about protecting their little eyes, because both Kevin and I had pretty poor eyesight growing up and even though we have a ton of kiddie sunglasses, they honestly don’t give the proper UV radiation protection. So this really was a wonderful solution to this dilemma I have been hitting up against. Real Kids Shades were created back in 2002 by parents, who just couldn’t find an inexpensive pair of sunglasses for their own kids to indeed protect from UV radiation. Their mission is simple in that they wanted to protect as many children’s eyes as possible from the negative effects of UV light. 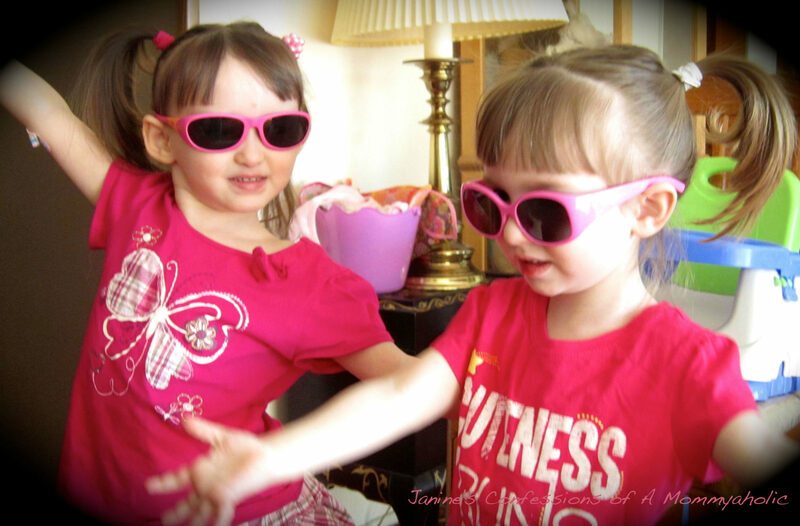 The Princesses Trying Out Their New Sunglasses for the First Time!! These sunglasses are not only doctor recommended, but they are comfortable, durable and stylish!! Both the Flex and Flex Duo are extremely flexible made from a rubber-like material that bends and twists, but doesn’t lose its shape. With little kids it is important that they durable and flexible, because I know first hand how easily my kids break things. Trust me, my garbage has become a revolving door for all they have broken over the few short years that they have been here!! Real Kids Sunglasses Worn Outside for the First Time!! Another wonderful benefit is that they are reasonably priced between $15-$20 and come with 100% replacement warranty if something should happen to them. Just send them back and they will replace them for a new pair of the same style, no questions asked. These awesome children’s sunglasses are sold in over 1,500 retail store and in 32 countries, as well as right on their website online. To find out more click the links by age below. And best of all, Real Kids Shades is giving one of my amazing friends the chance to win a pair of sunglasses of choice for their little one!! This post was written as a sponsored post for Real Kids Shades and I was compensated for my honest opinions. I'd give them a go if my child would allow me to put glasses on her face! She won't even let me put a clip in her hair! Lol, give her time Dani. Emma and Lily were both the same way and now I can't get them to not want to dress up and wear accessories all the time!! Such a fun giveaway. I need to get my boys some good shades this summer. Your girls look so cute in their pink shades!!!! Cute sunglasses for a couple of cute kids. This is a great giveaway, and omg…those photos of your girls in the sunglasses are too adorable. I love how they are pretending to be super stars in that first photo! Gorgeous pics; they look stellar. And very, very happy. Those are so cute! I wonder if they have blue or black for boys too? Your girls look cute in their glasses. 🙂 Thanks for the contest. Hehehe! YESSSSS!!! Love it hunny! Isn't the company so awesome for sending them to our kiddos to review AND Giveaway!!! 🙂 They are truly Princesses!! wow…they look adorable with those glasses. The glasses look reasonably priced too. Oh sorry about that, but you could go to their website and ask if they do anything with prescriptions or if they plan to, Stephanie. They look adorable. B won't keep anything on her head or face for more than a couple of minutes at a time, but when she's ready, I'll be grabbed some! These look so cool! I'm going to check them out for my son! Your girls are adorable wearing them! Your daughters look beautiful! Thank you for the great review and contest. These may be the cutest sunglasses I've seen for the price. They look super cute! Reagan has two pairs of glasses in each car! So she never goes anywhere without them! Those are so cute. Violet has some cute pairs that she leaves on for about 15 seconds lol.